We are now officially in a season that delivers many mixed messages to our inner biological rhythm – a hard wired need to turn inward and use the darker days to scour our inner landscape, release what no longer serves and plant seeds for the next year…bumps up against the often hectic schedule of the holiday season where we’re pulled into a lot of busy-ness, of course with so many blessings, but often a bit out of sync with our true needs. Because of this, we’re going back to basics this week, with a nod towards simplicity and emphasis on allowing the angels to set the priorities in your life. So today, we’re talking about the basics of angel card reading. How YOU can get a quick message when you need it most and know what it means. We’re about a year into the new website and I’m still loving its newness and the power of what it offers (big shout out to Rachel Dunham, Jenny Maloney and Green Status Solutions). One of my favorite pages is the online card picking tool – Guidance Now. I’ve long been wanting to create a digital card deck and it’s finally here! I’ll be adding to it as we go along, though for now there are 33 cards. All but one are inspired by photographs I’ve taken with my iPhone 7. I suggest you bookmark this page and make a habit of picking a card daily. As you do this, you’ll experience your angel communication skills expanding and your awareness of the angels’ messages on the rise. Before picking a card, really use the “pause and breathe” moment to center and balance your energy. Set an intention, ask a specific question or simply clear your mind to receive what we call “Angels’ Choice”. Use your intuitive sense to choose which card is right for you. Don’t worry – there’s no way you can possibly be wrong. Trust your gut! Once your card is displayed, notice how the image and the name of the card impact you energetically. Do you have one of those, “Oh yea, of course! I know what this is about!” responses or is it more vague and unclear? If you’re 100% certain of what your message is, you’re good to go! Carry on with your day allowing your angels to guide you. If you’re not so clear on the message, listen more carefully to your primary clairsenses. In other words, what aspects of the image or specific words jump out visually (clairvoyance)? What loving whispers are you hearing (clairaudience)? How are you feeling – are you more relaxed, uptight, has your throat closed or your shoulders relaxed (clairsentience)? And finally, what do you just know on an instinctual level (claircognizance)? As an example of my own experience with the Kiss the Frog card I drew this morning. At first, I knew it was a message to chill out and let God and the angels lead the pace of the day. I had been a little too in my head and needed this reminder. Later when I went back and read the message again, I heard “4th line in the message”. So I looked again and read this, “The ice dripping off of our frog friend lets you know that denial can keep your hands tied”… exactly what I needed to hear in that moment. I was trying to control an outcome of a situation Peter and I have been dancing with. I pray this helps you to connect more deeply with your angels. Remember, angel communication is your birthright. Know the truth within you! If a new comment is posted: Do not sent email notifications Send email notification ONLY if someone replies to my comment. Send email notification whenever a new comment is posted. 3 essential things you can do every day to start communicating with your Angels. Start communicating with your angels now... Even if you think you can’t! 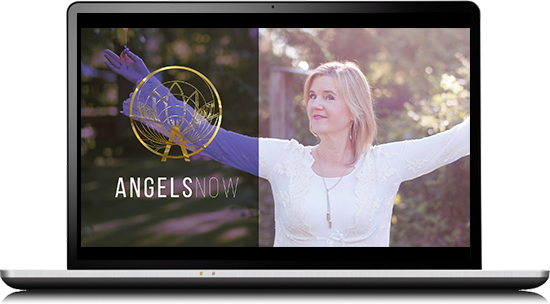 We’ll show you how in our free video training: AngelsNOW! Yes, Please! send me the training!